Pelvic Pain - Pamela Morrison Pelvic Pain Physical Therapist, P.C. Pelvic Pain - Pamela Morrison Pelvic Pain Physical Therapist, P.C. 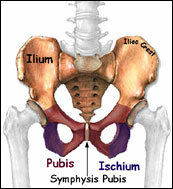 Pelvic pain may be acute, chronic, or recurring. Chronic pelvic pain is pain that has been present for more than 3 months. Both men and women can experience chronic pelvic pain. Pelvic pain is pain in the groin, lower abdomen, sacrum, coccyx (tailbone), vaginal, testicles, or rectal regions that can spread to the thighs, lower back or buttocks. Issues and diseases that contribute to or cause chronic pelvic pain include gynecological, urologic, gastrointestinal, musculoskeletal, neurological, trauma, sexual dysfunction, and depression. These issues can be related to myofascial trigger points in the abdomen, low back, and pelvic floor muscles. How can Pamela Morrison Physical Therapy, P.C. help men and women with pelvic pain? Our comprehensive pelvic evaluation will help to identify the cause or perpetuating factors of your pelvic pain. An extensive medical history and physical exam will help determine whether poor posture, tight painful muscles, trigger points, weakness, or nerve disorders are a contributing factor. Other factors we evaluate include tight scar tissue or adhesions, misaligned joints, and faulty movement patterns. Treatment techniques that we find extremely effective with patients with pelvic pain include advanced manual techniques such as myofascial release, joint mobilization, nerve tissue tension release, and stretching. Correcting abnormal movement patterns and posture via neuromuscular re-education, therapeutic exercises and core strengthening is another goal for our patients. Incorporating pain reducing strategies using modalities such as moist heat, cold packs, therapeutic ultrasound, electrical stimulation and TENS is another component of our care.